Several engine power-loss and damage events have occurred in convective weather above the altitudes typically associated with icing conditions. Research has shown that strong convective weather (thunderstorm activity) can lift high concentrations of moisture to high altitudes where it can freeze into very small ice crystals, perhaps as small as 40 microns (the size of flour grains). These are the crystals that can affect an engine when flying through convective weather. The industry is using the phrase "ice crystal icing" to describe these icing conditions, and to differentiate it from icing conditions due to supercooled liquid. Ice crystals do not adhere to cold airframe surfaces because the ice crystals bounce off. However, the crystals can partially melt and stick to relatively warm engine surfaces. "Glaciated conditions" refers to atmospheric conditions containing only ice crystals and no supercooled liquid. "Mixed phase conditions" refers to atmospheric conditions containing both ice crystals and supercooled liquid. Both glaciated and mixed phase conditions occur in convective clouds and have been present during engine power-loss and damage events. On-board weather radar can detect large particles such as hail, rain, and large ice crystal masses (snowflakes). Small particles, such as ice crystals in high concentrations near thunderstorms, are invisible to on-board weather radar, even though they may comprise the majority of the total mass of a cloud (see fig. 1). This NASA Tropical Rainfall Measurement Mission (TRMM) combined satellite radar image shows a vertical cross-section of a convective storm. 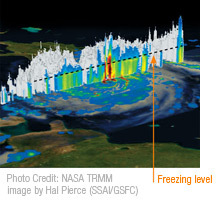 The image shows the freezing level clearly by the "bright band" where ice particles become coated with melted water and are excellent reflectors of radar energy. Below the freezing level, liquid water is highly reflective. Above the freezing level, while the concentration of moisture may still be high, the cloud is mostly composed of frozen ice particles with radar reflectivity below 20dBZ (units of radar energy). Small ice crystals are irregular in shape and poor reflectors of radar energy. These small ice crystals are believed to be associated with engine power-loss events. Sophisticated satellite radar technology has been used to detect crystals smaller than the lower limit of on-board weather radar. Above the freezing level, where icing can occur in a deep convective cloud, satellite radar has confirmed that large particles, which can be detected by on-board weather radar, are only found near the convective precipitation core. Away from the convective precipitation core, satellite radar has confirmed that small ice crystals, which are invisible to on-board weather radar, exist. For this reason, flight in visible moisture near deep convective weather, even without radar returns, and at temperatures below freezing, is very likely to be in ice crystal conditions. Ice building up on the inlet, fan, or spinner would likely shed outward into the fan bypass duct without causing a power loss. Therefore, in these power-loss events, it is reasonable to conclude that ice must have been building up in the engine core. It is now believed that ice crystal icing can occur deep in the engine where surfaces are warmer than freezing (see fig. 2). Both older generation jet engines and the new generation of jet engines (high bypass ratio engines with electronic engine controls) can be affected by ice crystal icing. Researchers hypothesize that ice particles enter the engine and bounce off surfaces colder than freezing (inlet, fan, and spinner). Once reaching surfaces warmer than freezing in the core, some of the small particles can melt and create a film of water on the surface to which additional incoming ice crystals can stick. This process gradually reduces the temperature of the surface until ice can begin to build up.